Abbey United headed paper, showing the club's foundation year as 1912. Although a football club called Cambridge United was formed in 1910, this club was not connected in any way to the present Cambridge United. In fact, it only lasted four years before it amalgamated with Cambridge Town. The Cambridge United we know and love today was formed in 1912 and was originally known as Abbey United. The club's formation and early existence was so poorly recorded that for many years it was believed that it was formed in 1919, shortly after the First World War. 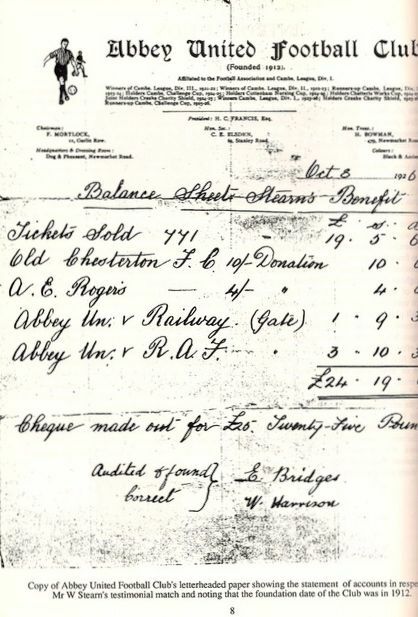 When Paul Daw, a former club secretary, was researching for his 1988 book United in Endeavour, he uncovered a copy of the club's balance sheet on headed paper (left), which states that the club was founded in 1912. Further research revealed that Abbey United was playing football in the 1913/14 season. Abbey United's beginnings were so modest that no written records of meetings, or indeed matches, exist. This is hardly surprising, for it's believed that these early meetings were held under street lamps in Stanley Road. The match was played on Midsummer Common on Thursday afternoon. The Abbey United team was: Pink; Golding, Howlett; Codling, Smith, Hancock; H Smith, Deers, Maltby, Coulson, Blunt. The goalscorers were Blunt, Hancock, Coulson and Maltby. Abbey United is known to have played at least 19 matches that season, finishing with a record of won 11, drawn 1, lost 7; goals for 60, goals against 38. The outbreak of the First World War in 1914 brought a sudden end to football. Although the Government didn't ban it, the football authorities agreed that it was in the best interests of the nation that all competitive football should close down until the war ended. Soon after the end of the war, a number of Abbey Ward residents held a meeting to reform Abbey United. Reverend W Warr, Curate of the Abbey Church, was elected as Club President, Mr SJ Brown was elected Club Secretary and Mr RJ Wadsworth became a committee member, starting a long association with the club that would see him become a Director when the club became a limited company in 1953. Abbey United played its first game after the war at its new home on Stourbridge Common on Saturday, 20 September 1919, against Ditton Rovers. The match resulted in a 6-3 win. The season ended with Abbey United having played seven matches, five of them on Stourbridge Common. They ended with a record of three wins, three draws and only one defeat. Perhaps this early link with Stourbridge Common gives a clue as to how the club came to be associated with Coconuts. For over 700 years, a fair had been held on the Common and by the early 20th century coconut shies were very popular sideshows. Although the I've Got a Lovely Bunch of Coconuts song that we love today was still to be written, it only needs a little imagination to hear the showmen shouting about their 'lovely coconuts', which had only recently been introduced to Britain and were looked upon as being exotic. The first season of the 1920s saw Abbey United play in a six-a-side competition at Littleport Football Club that attracted 1,350 spectators. Abbey won through to the quarter-final but could not claim their place because the players had to get back to Cambridge before the conclusion. The 1921/22 season saw United play their first season of competitive football when they were accepted into Division Three of the Cambridgeshire Football League. Their first match, a 2-1 defeat of Abbey Crusaders on Stourbridge Common on Saturday, 27 August 1921, was followed by a 4-0 win at Cherry Hinton St Andrews on September 3. The following week they were at home to Chesterton Rovers and chalked up an amazing 12-0 victory, with Wally Wilson scoring five times. The season ended with Abbey United as champions, nine points clear of runners-up Burwell Rovers. Local philanthropist Henry Clement Francis, a man with a special affection for the Abbey ward, became the club's President. The club's headquarters were at the Mission Hut in River Lane, and on matchdays the goalposts had to be carried along the riverside to the pitch on Stourbridge Common. 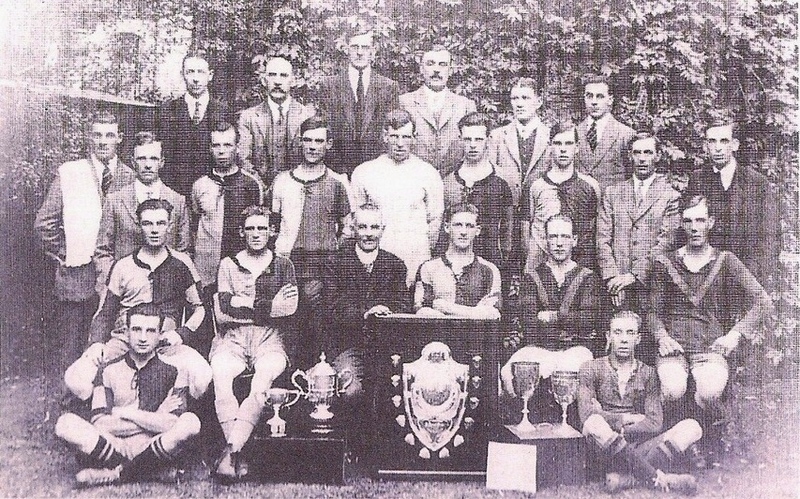 The 1922/23 season saw the team surpass the previous year's achievements by winning the Division Two Championship, dropping only three points in 22 matches. In winning 20 games, drawing one and losing one they scored an amazing 80 goals – most notched by Wally Wilson and Albert 'Twitter' Dring – and conceded only 10. This was the season that a young Harvey Cornwell joined the club; he was to go on to become the club's longest-serving player before retiring in his late 50s. Abbey United reached their first cup final in 1923 but, after beating Old Chesterton Rovers, Over Hotspurs, Chatteris Town and Soham Comrades in the the Cambs Minor Challenge Cup, they lost 2-1 in the final at Cambridge Town's ground against Cambridge GER (Great Eastern Railway). In preparation for their first season at the top level of the Cambridgeshire football pyramid, United moved from Stourbridge Common to a new ground at Station Farm, Barnwell, which they hired from Mr Bert Rayment. The ground became known as the Celery Trenches because of the persistent long furrows that ran the full length of the pitch. The site was later to become part of Marshall's Aerodrome and now forms part of the Whitehill housing estate, near the junction of Elfleda Road. The club's headquarters were moved to the Dog and Pheasant pub on Newmarket Road. The first match at the new ground was a 1-0 victory against Histon Institute on 8 September 1923, Albert Dring scoring the goal. Matches at the Celery Trenches regularly attracted crowds of over 300. Despite being the new boys in the top league, United were strong challengers for the championship. The title race went down to the last three matches, which saw the team having to travel to both their main challengers, Saffron Walden Town and St Ives. Three points from the two games would have been enough, but they managed just two draws and lost the title by one point to St Ives. Compared to the previous three seasons, the 1924/25 league campaign was mediocre: the club finished in mid-table with 19 points from 18 games. But success came in cup competitions, with the club reaching four finals. In the first, the Chatteris Engineering Works Cup on 11 April 1925, United beat Cottenham United 5-0 (Cornwell scoring four) in front of over 2,000 and with gate receipts of £30. United appeared in the Cottenham Nursing Cup Final two days later and goals by Wally Wilson and George Alsop were enough to beat Girton United 2-1. On Saturday, 18 April 1925, the same two clubs met again at Cambridge Town's Milton Road ground in the Final of the Cambs Challenge Cup. This time Abbey ran out 6-1 winners, Cornwell getting a hat-trick. And the last of the four finals was again at Milton Road on May 2 against United Cantabs in the Creake Charity Shield. This time, Abbey United had to settle for a share of the trophy after a 1-1 draw after extra time. Abbey United's first superstar remains the only player to score five goals on three separate occasions. Wally Wilson also holds the record for the most hat-tricks for the club with 14. He played well over 300 games for Abbey between August 1921 and May 1947, scoring more than 120 goals. His goalscoring prowess was legendary, and he was loaned to Cambridge Town (now Cambridge City) for certain League and FA Cup matches. In the 1920s, Abbey United played in amber and black striped shirts, which earned them the nickname of the Wasps, and it was Wally who, it was said, provided the sting. Fast and tricky, he was unafraid to leap in where lesser players feared to tread. His bravery was exemplified by his heading ability; it was said he could head a ball further than most players could kick it. As the years went by and the team became younger and fitter, Wally got broader, heavier and slower, so he was converted first to a wing-half and then to a centre-half, the kingpin of the team. Many a young upstart opposition forward would wince when confronted by Wally's formidable, granite-like figure. By this time, he was clever enough to delegate tasks that involved running to younger, fitter players, and was rarely seen outside the penalty area. In a match against Cambridge University Press in February 1935, Wally had 'bad words' with the referee and became the first United player to be sent off. He scored his final hat-trick in April 1936, seven years after his last and 15 since his first. Wally spent most of his life in the Stanley Road area of Cambridge and, when the club's headquarters were in the Dog and Pheasant, he would often help to take the goalposts from the pub to the ground and then walk back home to change. After his retirement from football Wally continued to work at the Cambridge Gasworks, and he played for the Gasworks Married Men against the Single Men at the Abbey. Abbey United First Team 1924/25. Back row: F Adams (Vice-President), F Brown, C Harrison, H Bowman (Hon Treasurer), HF Newman, CE Elsden. Standing: Tom Bilton, Fred Mortlock, (Hon Secretary), Joe Livermore, W ‘Pimp’ Stearn, R ‘Percy’ Wilson, Jim Self, Harold ‘Darley’ Watson, William Taverner, W Harrison. Sitting: Bill Walker, Harvey Cornwell, Henry Clement Francis (President), George Alsop (Captain), Bob Patman, Charlie Taverner. Front: W ‘Fanny’ Freeman, Frank Luff.